It was frigid to be on a bike today to say, to say the least. 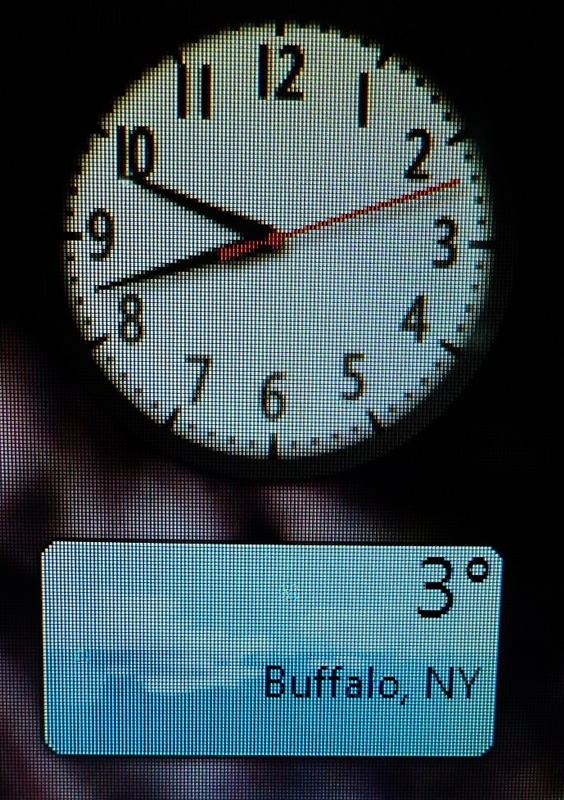 That's a screen shot (below) of my computer as I left the house this morning (3F/-16C)...it "warmed up" to about 16F/-8C later in the day. In a couple days the temps are supposed to rise to nearly 40F/4C...with the crazy weather these days it's often a guessing game as to how to dress before hopping on the bike. And it's interesting how many people ask if I'm not cold on the bike in this weather...the answer is always a quick no. That said, I will say that my fingers get cold (I need a new set of gloves). But dressed appropriately--in this weather I also cover my mouth and nose with a scarf, lest I breath in the frigid air too quickly--I actually find myself sweating, not freezing. I think it would be far more uncomfortable to be out scraping a windshield on a car than hopping on a bike and riding. 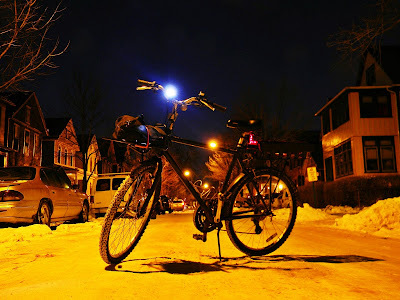 That said--and I know other all-weather cyclists will agree with this--there is really nothing like pedaling down a deserted city street at night (it's difficult to coast in the snow) and hearing your own breath and the sound of your tires crunching the snow beneath you. We finally did get snow in Toronto late last week. I have to admit that I haven't been out on the bike since it snowed. All the mild weather we had lulled me into a false sense of complacency and I failed to get my winter bike prepped for the season. It is funny how we can delude ourselves. Even though I like to ride throughout the winter I have to admit that I am more or less a fair weather cyclist Luckily I work from home and don't have to commute and when the weather is beyond me I simply walk to the shops. Even if I don't ride though, I do get out on foot every day. One of your observations really did strike home with me. I have done a lot of evening and very early morning walking and running during winter. 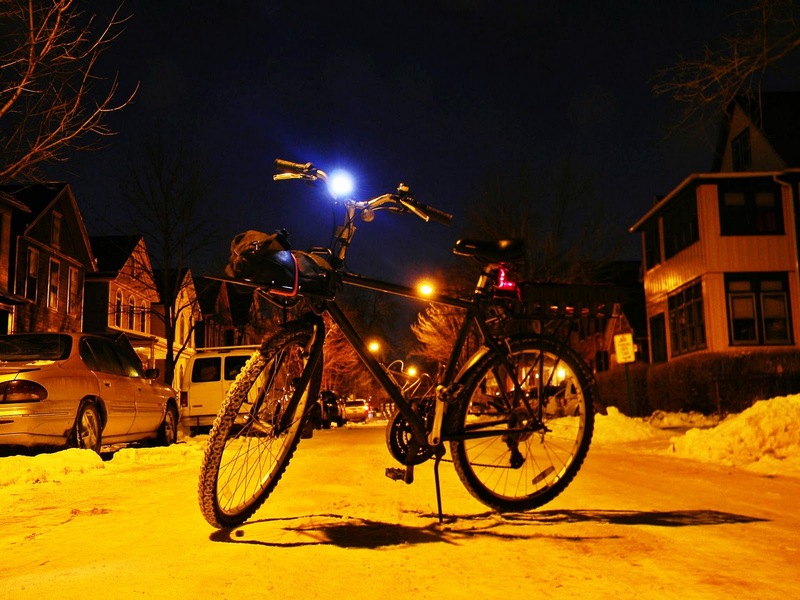 You are quite right--there really is nothing like pedaling (or walking or jogging) on a deserted city street at night. I am always overwhelmed with a sense of quiet, solitude and peacefulness. Keep warm, and enjoy the winter! Kevin, thanks for your kind words and insight. Riding (or walking) in the snow is really special to me, so long as I'm warm. Now, as I type these words a mere 24 hours later it is something like 40F/4C and raining...weird weather to say the least.